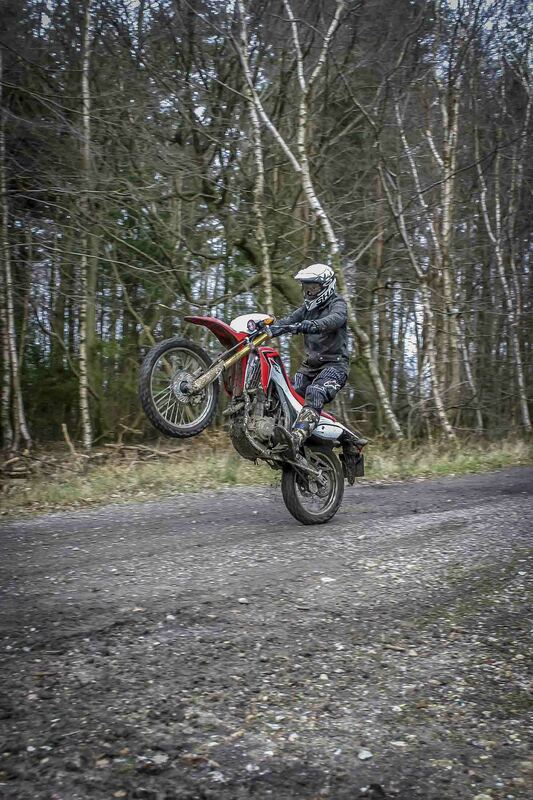 For the first part of this year, we’ve been running Honda’s CRF250L as a long term test bike. Here’s the latest installment of trials and tribulations as a SuperBike long termer. The wee CRF is officially motorway-proof, hurrah! This month’s quarter-litre exploits took us on a trip to central London in rush hour. Without mirrors. During a tube strike. Freshly muddy from the weekend’s greenlaning, the Honda found itself dicing with Audis in the fast lane of the A1 at exactly 70mph, plus or minus 15mph. So there were no effortless roll-on overtakes going on, but with a bit of forward planning, motorway commuting was fine for a 10-mile stint. If we were talking about slogging it for 200 miles up the M1, we might have a bit more of an issue. With the standard-issue trail tyres on, stability wasn’t exactly rock solid – giving the bars a prod at 80mph got the CRF into a little weave, but it was nothing that troubled the underwear. After the blast on dual carriageway, the traffic congealed to a standstill and the CRF was king once more. The ASBO kid in me would have loved a loud exhaust to braap revenge on the Audis that had hustled me from the fast lane miles before, but had to settle for a smug waft past. As the traffic thickened, the light weight and tight turning circle that lets the CRF chew up muddy trails did the same thing to traffic and more than made up for the wide handlebars. Best of all, big wheels and decent suspension open up a whole new world of kerb-bouncing opportunities – there’s never an excuse for getting boxed in on this thing. I’ve ridden dirt bikes in the city before, it’s always good fun but there are usually a couple of bits that cause stress. One is the noise – a two-stroke enduro bike is like a flashing beacon in the middle of town, screaming ‘look at me, I’m doing bad stuff’ at every touch of the throttle. As I’ve already mentioned, the CRF is quieter than a librarian with a sore throat – perfect for stealth misdemeanors. The second is the nagging fear of theft – leave a proper dirt bike unattended in London and the lack of ignition key or steering lock will get it pinched before it’s even cooled down. The CRF does, at least, have a proper ignition and steering lock which is a start, but I still wouldn’t leave it anywhere without a pair of massive locks holding it down. Or park it behind security guards and armed police, that worked too. On the ride home, after succeeding in not getting stolen, the CRF tackled traffic, motorways, dirt tracks and B-roads, putting a smile on my face at every junction, proving its versatility. It’s a jack of all trades, master of none in every sense; unless you can afford a bike for each and every trade, the CRF is perfect for opening up your two-wheeled horizons. The do-it-all bike er, does it all. Best. Second. Bike. Ever.